Bathers' rash: a stinging question. Being stung while swimming in the sea is common but being stung underneath one's swim suit, appears to be a new phenomenon that may be here to stay. It has perplexed many because the stings occur inside one's swimsuit rather than on exposed skin. Then again, some are affected and others not. What could this mysterious affliction be? Sea lice? No. The answer is rather surprising, but shows that we can defend ourselves easily. For several years now, people have complained about being stung underneath their swim suits. Some thought it was caused by being alergic to the new kind of material (Lycra) that these are made from. Others blamed sea lice. These fast swimming sea slaters that stay alive by biting fish and drawing blood, find humans an easy target, particularly at night when they abound. But the stings occurred underneath some swimsuits, where the skin is protected against sea lice. So what causes these stings? Two visiting American scientists (Anita and Hugo Freudenthal) found that the stings were caused by the juvenile stages of jellyfish. Both its planula and ephyra larva are capable of stinging humans. The problem (Sea Bathers Eruption or SBE) arises from the type of swimsuit (first and last in the swimsuit parade photo) that covers most of the body. Unfortunately these styles are worn only by girls. When swimming, the neck part opens slightly, letting seawater in. Because these modern swim suits are made of fine-meshed Lycra, they work like plankton nets, letting the water through but straining out small planktonic animals. The jellyfish larvae sting where the swimsuit squeezes against the body, particularly on buttocks and groins. The itching rash may last for weeks, depending on the person's sensitivity to jellyfish stings. As first aid one should apply vinegar as soon as this kind of rash is suspected, but one can avoid being stung by wearing a tee-shirt with a narrow collar over one's swimsuit. These kinds of stings have not been reported before and may very well be associated with the new conditions of our coastal sea water. The life cycle of a jellyfish is described in the box on this page. For jellyfish to become a plague, not only does their food source need to be abundant but also free space on rocks for their polyps, which are unsuccessful in settling on top of other organisms. In recent years our coasts have been plagued with dense plankton blooms that produced rich quantities of sea spark (Noctiluca scintillans), often seen floating on the surface as 'red tide' pink slicks. These swimming (!) 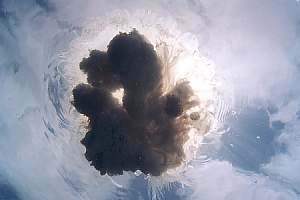 plankton plants are extraordinarily large dinoflagellates of about one millimetre round, containing copious amounts of jelly. When these abound, some jellyfish (like Pelagia noctiluca, and Cyanea) can grow larger than a car tyre in little over one week (see photo), reproducing prolifically. The name noctiluca, used for both organisms, means 'giving light at night', a property the jellyfish may acquire from eating the seaspark dinoflagellates. While being beneficial to the jellyfish, the dense plankton blooms have at times been poisonous to many animals, resulting in sponges and seasquirts and even fish dying in large numbers. The spaces that these deaths made available, was quickly occupied by the polyp stage, producing uncountable new jellyfish. It is still too early to say whether jellyfish plagues are here to stay. The dense plankton blooms of 1992-1997 appear to be associated with a ten year 'El Nino' cycle, due to be back in 2003-2008. Who knows? This jellyfish was photographed from underneath, looking up to the sun in a cloudy sky. The Cyanea lamarcki species measured more than a car tyre across. 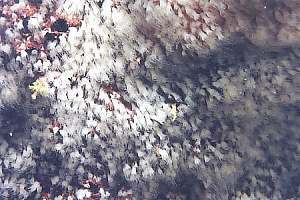 A hand-sized patch of jellyfish polyps underneath a rocky overhang shows how prolific this stage can be. Each polyp can bud off scores of ephyra medusa. This jellyfish was photographed on Blind Bay beach, Great Barrier Island in October 2006. 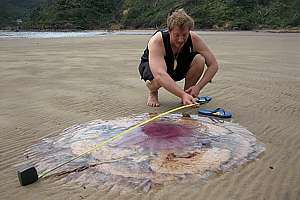 The Cyanea capillata species measured more than 1.5m across, when flattened like this. It may have grown this large while eating other jelly organisms like the sea spark dinoflagellate, Noctiluca scintillans= night-light that sparks. Photo: John Mellars. 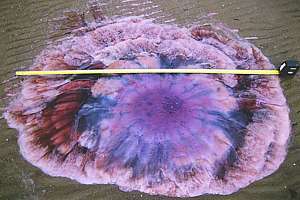 This purple lion mane jelly measured 1.2m across. In the centre is the purple bell with which it swims, surrounded by fully retracted and torn tentacles. The whitish mass are its gonads or eggs. An animal this size can have some 15kg of gonad, amounting to tens of millions of eggs. Photo: John Mellars. Jellyfish feed on zoo plankton, which feeds on phyto plankton, which in turn needs nutrients and sunlight. Once fully grown, jellyfish spawn eggs and sperm, which combine in the water. From the tiny fertilised eggs develop invisible blastula, which are hollow spheres of cells. From these develop planulas that can swim by means of vibrating hairs (cilia). Although invisible to the naked eye, these can sting. For the next stage, the planulas have to find an empty space underneath a rocky overhang where they metamorphose into polyps (scyphistoma). The polyp rapidly buds off many segments like stacked saucers, which detach to become swimming larva (ephyra), completing the cycle as pulsating medusa. When small, these too are invisible but sting. In the right conditions, jellyfish can multiply very rapidly to become a swimmers' plague. Lycra (also known as Numa, Spandelle and Vyrene) is a polyester urethane elastomer that has outstanding resistance to attack by ozone. Generically known as spandex it is used for its highly elastic properties. Spandex fibres can be stretched about 5 times beyond their original length without breaking, and quickly rebound. The fibre is easily dyed. It absorbs very little moisture. Spandex fibres are frequently covered with other fibres such as nylon. It is used in foundation garments, support hosiery, and swimsuits. It is light in weight and cool, resistant to deterioration from body acids and is easily laundered and dried.